There are a number of WW2 stories, like the valiant pilots in the battle of Britain, the small Island standing alone against a deadly aggressor and the indominable spirit of ordinary people who didn’t let the blitz break their resolve to see it through to the end, that, quite rightly fill you with pride. However, there are some stories which do the very opposite. I heard it said once that to survive the deprivation of WW2 even the most upstanding citizen dabbled in the black market. Even if that is true, I think there’s a great deal of difference between getting a few extra eggs or an orange for their children to the widespread looting, burglary and even murder that went on under the cover of the blackout. 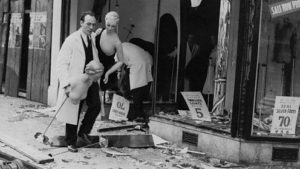 It’s hard to imaging as we look back over seventy years that although for the vast majority of people the outbreak of war was the nations fight against fascist tyranny, a small minority saw it as a golden opportunity to line their own pockets. Wally Thompson, an harden criminal, called the nightly blackout blitz ‘the best ally London Crooks ever had’. Billy Hill, who was known as the king of the London underworld, called them‘…roaring days. Money was easy, the villains were well-loaded. With dough and were busy. Either earning it or spending it.’ (Levine 2015). A shop that has been stripped out by looters. 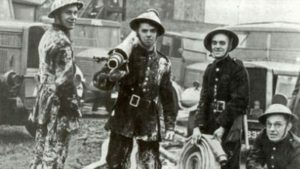 For those who earned their living by burglary and theft to operate under cover of darkness and they were unhindered as the police were too busy assisting the civil defence volunteers each night to keep up with the villains. Aside from those to whom crime was a way of life other ordinary citizen who in ordinary time wouldn’t have dreamed of robbing their neighbours with doors blow off and windows missing grasped the opportunity to help themselves. Sad to say, sometime the thieves and robbers were the very people, fireman and ARP rescue service personal, who were supposed to be helping save life and limb but who were actually the people walking off with bomb victims’ jewellery, money and even clothes. 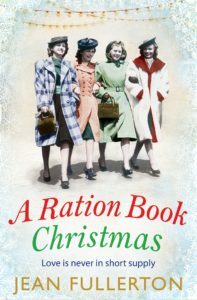 It’s against this backdrop of crime that I’ve set A Ration Book Christmas, the second of the Brogan Family Ration Book Series. It’s just after lunch and I’m in the back yard of Garfield’s Village store in Melton Winchet and I’ve just spotted Jo Brogan, the person I’m waiting to see, walk out the back door. Me: aren’t you a bit old for that? Ration Book Christmas. In the darkest days of the Blitz, Christmas is more important than ever. Blackpool Lass by Maggie Mason aka Mary Wood, is the story of Grace Rimmer battling bereavement, financial and personal hardship to find happiness at last. The drama takes place against Blackpool in its pre-WW2 hay-day with sideshows on the pier and the legendary Blackpool rock. Grace’s struggle starts after her mother dies and her father sinks into despair. She falls back on the support of her grandmother who herself is in poor health and so Graces trails and tribulation loss and heartbreak begin. Black days follow where she is caught in the heartless 1930s orphaned children system where her fighting spirit is tested to the limits. As I don’t want to spoil your enjoyment of a Blackpool Lass, I can’t tell you how Grace overcomes all her many problems but as always with Mary’s stories, poor Grace goes through much heartache and suffering and many twisted and hold-your-breath turns before triumphing at last. 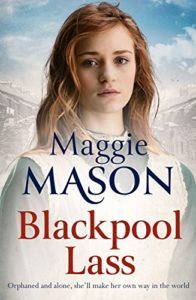 Blackpool Lass is in the grand tradition of sagas set down by the late and great Catherine Cookson, with a strong fearless heroine facing all that life can throw at her. It is full of sweeping drama and tear-jerking heartache before overcoming all her trials and tribulations. It’s a page turner so I read Blackpool Lass from cover to cover in 2 days and have no hesitation in recommending it to all you saga lover. Maggie Mason is a pseudonym of author Mary Wood. Mary writes historical sagas for Pan Macmillan covering the late nineteenth century to mid-twentieth including both wars. She has 9 books in print and another – THE FORGOTTEN DAUGHTER is realeased in December. 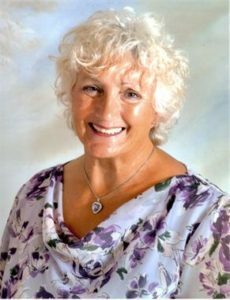 Under her pen name of Maggie Mason, Mary writes regional sagas set in Blackpool, again covering the time period as above. She has her first THE BLACKPOOL LASS published this week – 20th September. Mary lives in Blackpool and enjoys researching the history of her home town, coming up with some surprising facts and excited to uncover material for future books. Born the 13th child of 15 children, Mary experienced life at the raw end. Though she says of her childhood that though poor they were happy and were rich in love. 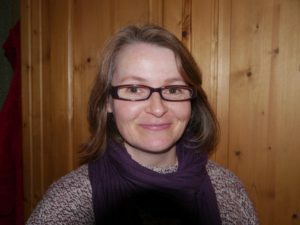 Mary writes full time now having ended her 9 – 5 working life in the Probation service. This experience gave the grittiness she brings to her writing as Mary says she feels compelled to tell it how it is. Usually my blog is something about East London and its connection to my novels and this one is no exception except the link is a bit more tenuous. On Friday night the Hero@Home and myself went to London for a very special evening at the theatre. It wasn’t so much that we had tickets for a West End play but who the star of the production was. 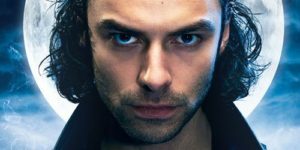 Now as most of you who follow me know I have a bit of a thing about Aidan Turner so when I tell you the show we went to see was the Lieutenant of Inishmore, with him in the title role you’ll understand why it was a special occasion. 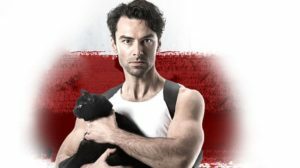 However, although the majority of the female members of the audience were there to see Aidan strut his stuff as Padraic, homicidal, cat-loving terrorist, his presence didn’t dominate the production. The Lieutenant of Inishmore is very much an ensemble piece and had with excellent performances by Chris Walley as Davey, Denis Conway as Padraic’s father Donny and Charlie Murphy, who many watching wanted to swap places with, as Padraic’s equally bonkers girlfriend. The whole two-act play motored along very nicely with many, many laugh -out-loud moments throughout, and wittily clever dialogue ‘there be no statute of limitation on mammy trampling’ being just one. Given the serious nature of the underlying subject matter this was a grand achievement. 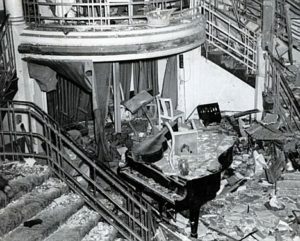 For some one of my generation who lived and worked in London during the IRA’s 1970s bombing campaign on the British mainland some of the references, such as the one to Airey Neave and trips to Belgium caused a moment of pause, but in the context of highlighting how stupid and mindless the violence of that time was it worked. Now, what might you ask has a play set in the 1980’s on the West Coast of Ireland about a bunch of crazy terrorists got to do with my Nolan Family East London novels? Well I’ll tell you. 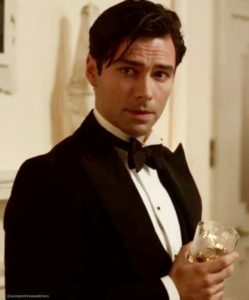 Ever since I saw Aidan Turner cast as the vampire with a conscience in BBC 3’s Being Human I’ve imagined him playing Patrick Nolan in a TV adaptation of my Victorian East London books, No Cure for Love, A Glimpse at Happiness, Perhaps Tomorrow and Hold onto Hope. Seeing him move across the stage and deliver his line with panache has only confirmed my choice. However, should my books ever be adapted for the small screen, I don’t think Mr Turner will available because I’m sure by then he’ll be universally known as Bond, James Bond. Really thrilled to be able to announce the release date and cover of the next book in my East End Ration Book series. It follows on from the first in the Ration Book Series, Pocketful of Dreams, so you can catch up with the boisterous Brogan family as they face up to the worst the Luftwaffe can throw at them. In the darkest days of the Blitz, Christmas is more important than ever. 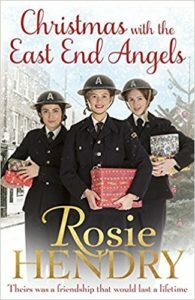 With Christmas approaching, the Brogan family of London’s East End are braving the horrors of the Blitz. With the men away fighting for King and Country and the ever-present dangers of the German Luftwaffe’s nightly reign of death and destruction, the family must do all they can to keep a stiff upper lip. For Jo, the youngest of the Brogan sisters, the perils of war also offer a new-found freedom. Jo falls in love with Tommy, a man known for his dangerous reputation as much as his charm. But as the falling bombs devastate their neighbourhood and rationing begins to bite, will the Brogans manage to pull together a traditional family Christmas? And will Jo find the love and security she seeks in a time of such grave peril? It will be released on the 11th October but is already up for pre-order on Amazon. Say hello to the lovely Mary Wood. Hi Mary, I know you write both Victorian and 20th century sagas but do you encounter any problems shifting back and forward a century? I love all era’s in history, and so never find it a problem to slip into one of them. Once I have an idea, and a setting, I‘m away with the story, building it with research, and characters to fit the time period, and soon immerse myself as if I am living the story. Why do you think these two periods dominate the Saga market at the moment? Then, along came Downton Abbey and the saga market lit up once more as readers wanted to read similar stories – I don’t see that waning just yet, although the market is getting flooded once more. I think that interest in war stories was triggered by reaching significant anniversaries of the two World Wars. And, in particular when we liberated women of today wanted justice for our grandmothers. 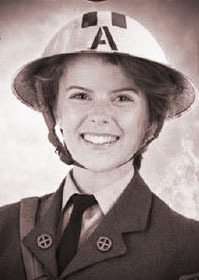 We wanted their deeds recognised, and in the process, everyone learnt more about Land Girls – Bletchley Girls, SOE’s – very courageous girls who worked behind enemy lines as spies, VAD’s, Red Cross Nurses, Munition workers, and so on. Suddenly there was wealth of stories with a real buzz around them and the genre took off. I know you live in both Spain and England but does traveling back and forward interfere with your writing at all? I try make sure that I haven’t a work-in-progress, and my desk is clear for the journey and at least a week after. Once there and settled, I work so well. The warm sunshine allows me to sit outside with my laptop and beaver away. I usually write two books during my winter break. However, I am now writing for two publishers and edits began to pile in at the same time, and so I only managed one and a half – I’m on catch up now. I know you get your first draft done in super quick time, so does that mean you have to do lots of re-writing once the stories down? It varies. Sometimes two or three scenes need to go, or be added in. Then I may need to bring some scenes to life as I find that I have under-dramatised a scene, or maybe, overdone it, so tweaks are needed. Along the way I will have left myself lots of notes of things I need to know, and these have to be researched and slotted in. For instance, I might need to set one of the character’s homes in a street that looks a certain way, but instead of finding out this information while I am writing, I post a comment to myself to research the area to find the street, and place it in when re-writing. Same might go for a station, particularly if a character is leaving London and I need to know which station and tube etc that she will use for her destination. I have to start by putting the journey in to google, then find out if any of the stations were there over one hundred years ago and if not provide alternative transport. All of this work can take a week of many hours work to fix. But I love this stage as the pressure is off – I have my story down, I have a beginning, a journey and an end. Polishing it all is a pleasure. Do you have the whole story in your head before you start or does it evolve as you write? I always think that I do, as I write a detailed synopsis, and this can be a comfort as you always know the direction you are heading. But, what emerges is sometimes quiet different, as the story goes along paths that are not in my planning at all. I love these moments. It is like watching a film and not knowing what is going to happen. What has been the highlight of becoming a published author? All of it. It has been just as wonderful as I always imagined – meeting readers, making friends with them, meeting professional ‘book-people’ in the industry, and being verified by them – they actually think I am a good author…wow!! Meeting other authors and the support we give each other. Going to meetings and publishing parties, book-signing, and giving talks – I love it all. And there are experiences still awaiting me as I haven’t yet managed to attend any of the wonderful Romantic Novelist Association events, or a book fair. Cannot wait for the time to be right that I can do these things too. Apart from writing what else do you do in your spare time? I relax with hubby. We love to go out to dine. And to spend time with our children, grandchildren and great grandchildren and of course close friends. I do have many interests, but not much time to give to them – reading, crosswords, days out exploring, and having picnics, playing scrabble, sewing, cooking . . . sigh, just to lists them makes me wish I had time to do them more often. 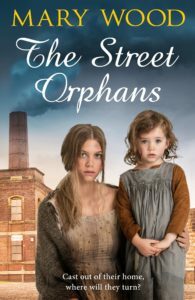 Will you give us a little taster of your new book The Street Orphans? 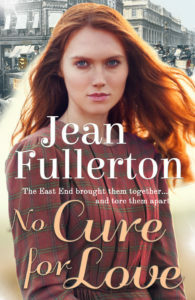 Interview with Ellen O’Casey heroine of No Cure for Love. It’s just after ten in the evening and I’ve just popped into the Angel and Crown on Whitechapel High Street to have a quick chat with Ellen O’Casey the popular supper room singer of the establishment. I know you’re due on stage soon, Ellen, but would you mind if I had a quick chat? Well, my friend Kitty’s doing her turn at the moments, so we should be all right. But I can’t be too long or Danny’ll be after us. I know you came here from Ireland when you were quite young, but can you remember anything about your homeland? I can remember things like the rough stone walls of the cottage we lived in and lying in bed listening to the mice scurrying about but one day dose stick in my mind. It must have been spring because I can still see the swallows in my mind’s eye as I think of it. A rare day it was, with the sun warming you and the smell the dew still fresh on the grass. Pa piled us all into the old rickety cart and took us all to the county fair. The fiddles were playing while young girls whirled in their new clothes laughing and smiling. The fellas in their rough working clothes and heavy boots danced like feather in the breeze and catching their lasses as they passed. It must be difficult for you as a widow to keep a roof over yours and your family’s head? It’s almost impossible and without my Ma I’d have been in the poor house long before now. We both up before dawn to fetch water from the pump at the bottom of the street. Then I go and collect the washing from the big houses while Ma heats the copper. All morning we scrub our knuckles raw on the washing board before drying and ironing it and then taking it all back at the end of the day. At night we sit by candlelight and sew collars from Miller factor. We get thrupence for two dozen. It barely keeps us, what with the rent and food being so dear. That’s why I have to sing in this place and sometimes down at the White Swan or Paddy’s Goose, Danny’s other pub. And if you think it’s grim in here, you should see that hole down on the Highway. I understand you’ve been alone for almost ten years so I’m a bit surprised you’ve not remarried? This area of East London is notorious for crime and violence aren’t you frightened of living here alone? For the most part I’m safe enough in Knockfurgus, the part of the dock where I live and most of us Irish are settled. It’s in walking distance of the riverside where there’s work to be had when the ships are in. Our street can be a bit rough, I grant you, but we all look out for each other. We share what little we have and that’s not much. There’s none of us who would let a child go hungry even if we had to skip supper ourselves. It’s the drink that makes it hard on a woman. I mean, no one would argue that a man entitled to a drink at the end of the day, to clear the dust from his throat but some, well; they don’t know when to stop and its his wife and children who feel the force of it, as often as not. Of course, I’m often scared out of me life when I have to walk home after singing here. But I keep to the main roads and go as fast as me legs will carry me. Sometime the beat officer will walk away with me and I can relax then. But I have to work here so there’s no point wailing about it. I notice that a number of women in the same situation as yourself often… well, how can I put this delicately?…take to the street. It’s true. If you peek though curtains you can see them sitting at the back of the room now. They are easy to spot with their bright dresses and red lips. Sad souls. And I for one, don’t condemn them for what they do. I mean, most of them have a child or two to feed and sometimes it the streets or the workhouse. And it can look easier that scrubbing sheets all day but there’s always a man lurking around who takes their money, not to mention the danger of being found by the peelers in the gutter with you throat cut. And if you live long enough you’ve got the pox ward at the hospital to look forward to. It seems an easy way but when I see what poor Kitty has to do to keep Danny sweet I think I’m better off on my own. Although, if I were honest with you now, I do miss the arms of a strong man around me when I snuggle under the blankets . I notice you get a fair few doctors from the London Hospital nearby take their supper here. In fact, that new medic, Doctor Munroe, is at one of the tables and keeps looking this way. Perhaps he’s someone you might consider giving up your widow’s weeds for? I hear also that although he’s only been here a month or two Doctor Munroe is already making his mark by introducing all sorts of health reforms, like a providing a proper water supply and sanitation to the slums. I also hear Mr Donovan, as chairman of the workhouse board isn’t too pleased with him looking into the workhouse accounts. Although, trying to improve the lot of the poor is very admirable Perhaps you should warn him he’s fishing in dangerous waters as far as Mr Donavan is concerned. I’m not. It’s just a little warm in here that’s all. Anyway, it’s a brave thing that Doctor Munroe’s doing and his surgery in Chapman Street where he charges only what he has to. But your right, he need to be careful. Danny’s been top dog around here for years and he doesn’t stay there by being nice to people who cross him. For his own sake, I wish Doctor Munroe would watch out for himself. It would fair break my heart if anything should happen to him. Know you work hard to pay for your daughter Josie to attend school but is it worth it seeing as how the only opening for a girl of her class is to enter service or marry a docker? Josie as bright as a button and with her brains she could teach school or work in a shop. I don’t mind her going into service because she would learn things I could never teach her, but it would mean her going away as there are no big houses around here. But to do any of those things she need her letters and figuring. My Pa knew that which is why he taught us all to read and do arithmetic. She had a fella, Patrick Nolan. He’s the son of my friend Sarah and he’s a good lad. dependable and hard-working but I’ve told him I’ll be after him if he takes advantage. I don’t want Josie to make the same mistakes as meself so I’m keeping a close eye on them just to be sure. You sound bitter when you talk of your husband. Was your marriage so bad? Have you ever considered returning to Ireland? After all you must still have family there. Besides, most of our family are over here in Liverpool and Bristol and my brother, Pat’s in America. He’s doing grand, so he is, and we’re hoping to join him soon. What do you think life will be like for you, Josie and your there? Whatever I do at least I won’t have to be dodging Danny’s straying hands while I earn a few coppers, but until then I’m afraid I’ll have to sing for all the O’Caseys’ suppers in the Angel and Crown. 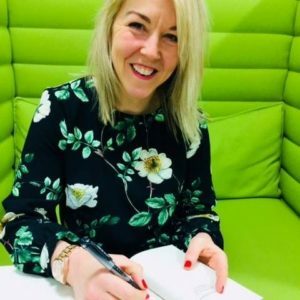 Hi, Kate, could you give us an overview of your writing career so far? Hi Jean. I trained as a journalist and spent twenty years working for women’s weekly titles like Pick Me Up, Take a Break and That’s Life! which was a wonderful training ground in the art of listening, as well as an insight into what women really want to read about. I also did spells at The Daily Mail and The Daily Express. I was Deputy Editor at Pick Me Up magazine when I was made redundant. I was heavily pregnant with my second son and it felt pretty catastrophic at the time. In panic mode, I launched myself into the world of freelancing. A friend of mine was working as a ghostwriter and put me in touch with her agent, Diane Banks. She took me on and after working as a ghostwriter on five books, my agent suggested I try my hand at fiction. Now I look back and see that redundancy as serendipity, as there as is nothing I would rather do more now than write books. 2) What is it about the WW2 that fascinates you so much? I think lives were lived so much more intensely and there was real potency and power to being a woman. Women really did step outside the home and discover what they were capable of. I interviewed a fascinating lady who was one of a handful of women to train as a doctor during the war. She leant forward in her chair and I was taken aback by the fierce determination in her voice when she told me: ‘In wartime, it was women who saved the day.’ It’s extraordinary when you think about it the way we carried on in a time when invasion seemed certain, and yet for so many, defeat simply wasn’t an option. 3) Why do you think this period is so popular at the moment? We live in such uncertain times. Immersing yourself in the warmth and nostalgia of the past can feel like an escape from the frightening realities we face when we switch on the news. Reading about a time when a country pulled together to face a common enemy and people lived collectively, not individually, offers an unshifting narrative. Obviously we are looking back through a rose tinted prism, can you imagine the realities of actually living in a war zone? Despite this, I don’t think there’s any doubt that communities were much closer back then, and in the absence of the Welfare State, women were the welfare state, caring for neighbours and family. I think there is a tangible sense of people craving the benefits of living in a tight-knit community. 4) What is a typical writing day for you? I drop the boys off to school, walk my ageing Jack Russell, Twinkle, then make a big cup of coffee, park my bum down and write until it is time to collect them. If I’m on a research day in the East End, I’m usually legging it up Whitechapel High Street en route to an interview or an archive. 5) Are you a plotter or do you write the story by the skin of your pants? I’m a plotter and something of a control freak. I admire people who can discover it as they go along, but that would freak me out. I start with a timeline and a detailed bio of each of my characters and go from there, combining research with writing. 6) What has been the highlight of becoming a published author? Good question. Nothing beats seeing your book on the shelves, or receiving a letter or email from a reader who enjoyed your book. 7) Apart from writing what else do you do in your spare time? My sons are 10 and 6, so a lot of time is spent running them to football, karate and swimming clubs. I do love running and exercise. I bought a stand-up paddle board last year, which I absolutely love. On the river it is great, but we took it down to Dorset last Easter and trying to stand up on it on the sea is another thing altogether. I spent most of the time face planting straight into the sea. I’m a bit of a fresh air and nature nut and it’s lovely to be outdoors when you’ve spent hours in front of a PC. 8) Have you any advice for aspiring Saga writers? Only to write about an area, or people for whom you have profound respect and affection for. I also think you have a duty of care to research that time frame as vigorously as you can. People do love to spot anachronisms so take care to make your writing as authentic as possible. I have lots of trusted wartime East Enders who do what I call ‘sympathy reads’ to make sure my writing is as accurate as can be. Also, be prepared to embrace and utilise social media. 9) Can you tell us a little about The Allotment Girls? When I stumbled upon a gem, like the iconic Bryant & May match factory in Bow, I knew firstly I had to set a book there. Next, I accessed the archives held at Hackney Library and started to read about the factory, its long history, its role during the war and its many social opportunities, like The Match Girls Club, and these vivid characters started to drop into my mind. 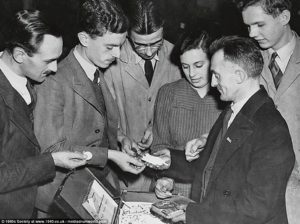 Shortly after I discovered the Bethnal Green Producers’ Association, which during the war saw 300 men, women and children from the borough transform the darkest of bomb sites into thriving allotments, using elbow grease, imagination and pierced dustbin lids to sift out shrapnel. 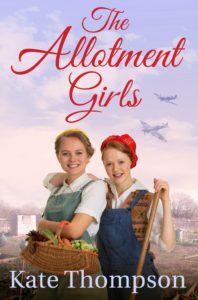 I had the beginnings of my story and the Allotment Girls was born. An allotment is a great stage for drama, all manner of illicit liaisons can take place there and secrets concealed beneath the soil. Thanks for being part of my blog tour, Jean. Work-life balance is a well-worn phrase which describes philosophical and ethical way of trying the get the right balance so you work to live rather than the other way around. The assumption of this philosophy is that the individual’s out of work life is more important than the in-work life. However, as a writer I have a slightly different take on this. When I tell people always take my laptop on holiday so I can keep up my word count while I’m away they throw their hands up in horror. 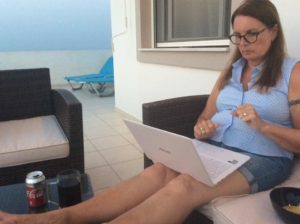 ‘But you’re on holiday’ they say ‘why don’t you just relax’ they say, ‘you should take a break from work’ they say, totally misunderstanding what writing means to me. Yes, it is what I work at but it’s not ‘work’. I don’t dread going to my desk each morning, when I’m struggling to write a difficult scene I have to break off for an hour sometimes but I never want to be away from the story I’m writing for weeks. And it certainly isn’t relaxing for me to have a story in my head hammering to get out and no means of writing it down. For me, a holiday isn’t a holiday without being able to write at least 500 words a day. In fact, in order for the Hero@Home to have a relaxing time away he insists I take my laptop. The truth of the matter is; even if I change location I can’t escape the current and future stories racing around in my head. And honestly, I don’t want to. So, along with the suntan lotion, swimsuit and beach towel my laptop is top of the list of my holiday essentials.